A 3-1 loser to Toronto Monday night, the Mariners send Felix Hernandez to the mound Tuesday to try to get him a win, which they failed to do his past 2 outings despite his brilliant work..
Felix Hernandez leads the American League in ERA (2.30), WAR for pitchers (5.7), innings pitched (160.2), ranks second in strikeout-to-walk ratio (5.72), third in strikeouts (166) and fifth in strikeouts per nine innings (9.2) and fewest walks per nine (1.6). Those are all Cy Young-candidate numbers, but they could be so much better. Since Hernandez entered the major leagues in 2005, he has made 97 starts in which he allowed one or fewer runs. That’s the most by any pitcher, ahead of Jered Weaver and CC Sabathia. Breaking down the 97, Hernandez has won 64 and lost four with 29 no-decisions. Think about that: Hernandez has allowed one or fewer runs 29 times without a positive (or any) result, including five times this season. Take his last two outings, the most recent examples of Hernandez pitching splendidly and emerging with nada. On July 26 vs. Minnesota, he allowed one run on five hits with 11 strikeouts and no walks in a 9.0-inning effort. He didn’t factor in the decision in Seattle’s 3-2 loss. In his last start, Aug. 1 at Fenway Park, he allowed one run on six hits with eight strikeouts and two walks. Hernandez left with a 7-1 lead and had to watch in horror/consternation as the Seattle bullpen gave the game away. So in his last two, Hernandez has ceded two runs in 16.0 innings, fanned 19 with two walks and has nothing but “NDs” to show for it. Hernandez gets a shot at win No. 12 Tuesday when the Mariners and Blue Jays play the second of three at Safeco Field. He has to hope for a better fate than befell Hisashi Iwakuma Monday night. Iwakuma yielded two runs on four hits over seven innings but came away with a 3-1 loss, barely outpitched by former Mariner R.A. Dickey. Hernandez’s start Tuesday, on paper, is a gimme putt — unless Toronto starter Josh Johnson suddenly morphs into vintage Pedro Martinez. Johnson is mired in the worst slump of his career, winless since June 23 against the Orioles. He has allowed 21 runs in the first two innings of his past six outings and has a 9.00 ERA over that span. The 27-year-old Hernandez, in his ninth major league season, all with Seattle, will make his 24th start and second against Toronto. Hernandez is 6-0 with a 2.11 ERA over his last 12 starts, but wound up with a no-decision Thursday when Seattle blew a 7-1 lead after he’d thrown seven innings of one-run ball. He threw eight scoreless innings at Toronto in a 4-0 win in May. LAST START: Aug. 1 at Boston, took a no-decision in Seattle’s 8-7 loss; 1 earned run on 6 hits over 7.0 innings; 8 strikeouts, 2 walks, 0 home runs, 107 pitches, 66 for strikes. LAST VS. BLUE JAYS: May 3 at Toronto, won 4-0; 0 earned runs on 5 hits over 8.0 innings; 7 strikeouts, 0 walks, 0 home runs, 95 pitches, 63 for strikes. CAREER VS. BLUE JAYS: 4-4, 4.52 ERA in 10 starts covering 67.2 innings; 60 strikeouts, 21 walks, 9 home runs, 1.30 WHIP. AT SAFECO FIELD: 55-37, 3.10 ERA in 129 starts covering 896.2 innings; 864 strikeouts, 241 walks, 69 home runs, 1.17 WHIP. LOVES TO FACE: J.P Arencibia (1-for-9, .111), Brett Lawrie (1-for-6, .167), Adam Lind (4-for-19, .211). HATES TO FACE: Colby Rasmus (3-for-5, .600), Melky Cabrera (5-for-17, .294), Rajai Davis (4-for-14, .286). CURRENT BLUE JAYS VS. HERNANDEZ: 44-for-175, .251 BA, 43 strikeouts, 10 walks, 3 home runs, .298 on-base percentage. The 29-year-old Johnson, a Minneapolis native in his ninth major league season and first with Toronto, will make his 16th start and first against the Mariners. A former All-Star, Johnson is in the midst of a horrendous season. He has lost six consecutive starts and been shelled in more than half of them. In his last three outings, he has allowed 18 earned runs on 24 hits. LAST START: Aug. 1 at Anaheim, lost 8-2; 6 earned runs on 10 hits in 2.1 innings; 1 strikeouts, 1 walk, 1 home runs, 67 pitches, 42 for strikes. LAST VS. MARINERS: Never pitched. CAREER VS. MARINERS: No record. AT SAFECO FIELD: Never pitched. 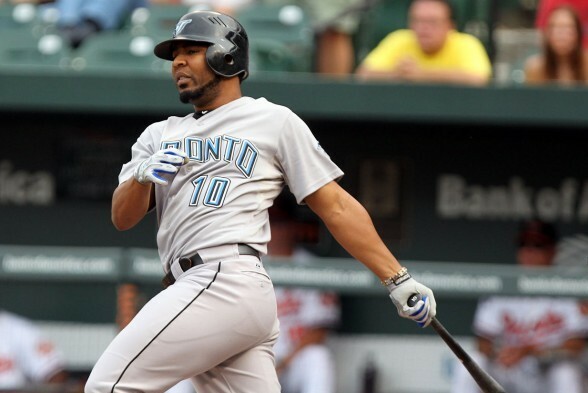 LOVES TO FACE: Justin Smoak (0-for-3, .000), Brendan Ryan (1-for-6, .167), Raul Ibanez (4-for-17, .235). HATES TO FACE: Humberto Quintero (3-for-4, .750), Michael Morse (2-for-7, .286). CURRENT MARINERS VS. JOHNSON: 11-for-40, .275 BA, 9 strikeouts, 0 walks, 1 home run, .275 on-base percentage. CURRENT HOME STAND: Three vs. Toronto (Monday-Wednesday), three vs. Milwaukee Friday-Sunday. Following the home stand, which will include Ken Griffey Jr.’s induction into the Mariners Hall of Fame Saturday, the Mariners will embark upon a nine-game road trip through Tampa Bay, Texas and Oakland. Hisashi Iwakuma is 7-1 in nine starts in which he has gone 7.0+ innings and allowed two or fewer runs. Iwakuma tied a season high with three walks. Iwakuma is 3-1 with a 1.91 ERA with 29 strikeouts and nine walks in his past five starts. Justin Smoak stretched his hitting streak to six games Monday with his 11th homer of the season. Kendrys Morales, 1-for-4 Monday, is 16-for-his-last-30, batting .533. Backup catcher Humberto Quintero, with two hits Monday, is batting .389 in five games since making his Seattle debut. Dustin Ackley started Monday’s game at his old position, second base, and played without incident. He went 1-for-4. Felix Hernandez (11-4), Hisashi Iwakuma (10-5) and Joe Saunders (10-10) all have 10 wins this season. Seattle and Detroit are the only AL clubs with a trio of 10-game winners. Felix should sue his teammates for non-support.